Media Size Choose an option14" x 21 1/2"20" x 30 1/2"
One of the greatest untold 20th Century stories is the genesis of the General Motors, Chevy division, Corvette. Originally designed by Harley Earl, in 1953, the Corvette was known as a “Dream Car” to many Americans. This timeless classic is rich in history, it’s also rich in nostalgia, meaning and hope for many dreamers who are in love with the classic American muscle car. 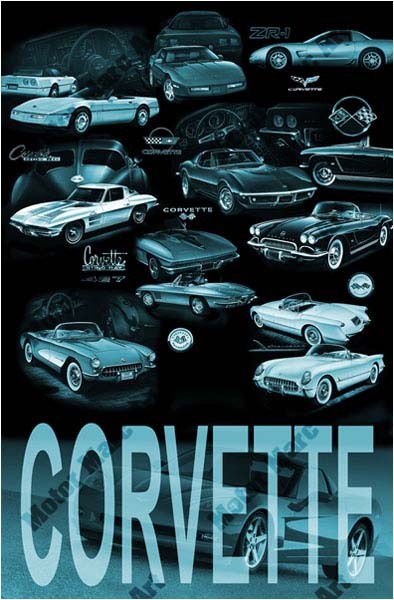 Throughout the 60’s and 70’s the Corvette solidified itself as the benchmark in American sports cars. Since the first Corvette rolled off the assembly line, American car enthusiasts have seen six generations of the vehicle and the seventh generation will be even more spectacular. 14" x 21 1/2", 20" x 30 1/2"